I texted my oldest friend to see if he was ok. The floods had been on my mind since the beginning of last week. I had meant to send the message on Friday. I don’t know what stopped me. Actually, I do know what stopped me, but it’s uncomfortable to explain the how and why of some things when they point out that your thoughts are conflicted. What stopped me was the desire to not be a bother when they could be in the middle of a dangerous situation or in the process of avoiding one. I could picture my imposition clearly. I practically scripted vignettes. Then I filmed them in my head. Then I replayed them. Jason, my friend, baseball cap pulled low, two-day stubble, dark shadows under the eyes, shouting and receiving instructions with his wife and the kids, trying to load up belongings and the dog so they can get to somewhere safe. Or, April, his wife, holding the hood of her rain jacket and telling the kids to stay inside so she and Jason can finish checking to make the house is watertight. And there, in the middle of lashing something down, or trying to hear a question, or something else equally urgent, there would be my message interrupting. So, I didn’t send a text on Friday. I waited until Saturday, and felt foolish before and after I sent the text. 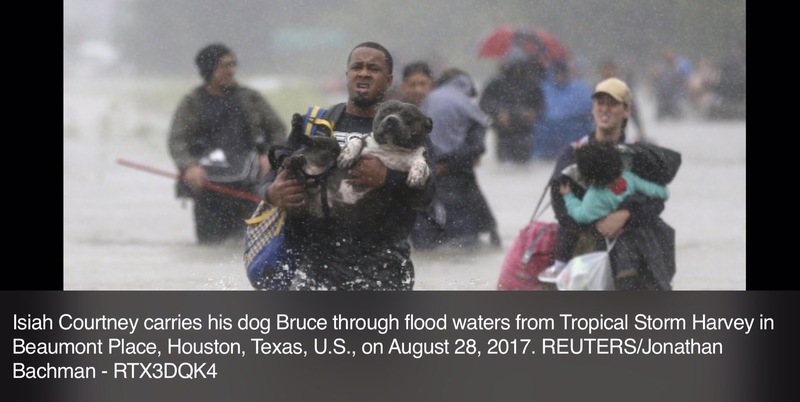 With all of the news devoted to Hurricane Harvey it’s easy to start worrying. The events surrounding the tragedy of Hurricane Katrina are a fresh memory. The water swallowing the streets like a river before climbing the sides of buildings and houses. Video loops of desperate families leaning out of windows, climbing onto the roof to scrawl messages listing the number of people inside. Elderly couples huddled in the rain while helicopters hovered above. Cars, bodies and all manner of garbage floating in a grimy sludge. And, for a moment there is an end. Despite a day or more of procrastination, I’ve done the check-in and now I know everything and everyone is OK.
Of course they are, because I finally remembered that they live near San Antonio and the storm was moving East toward Houston, the targeted destination. For the rest of Saturday and Sunday I check the news. 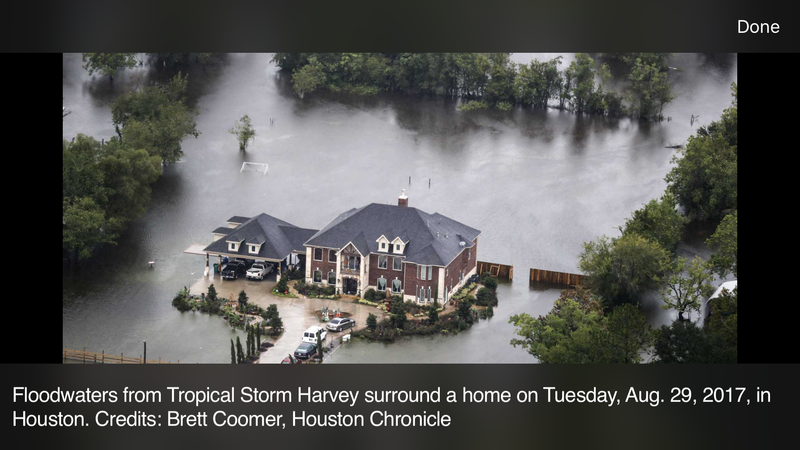 The storm besieges Houston. Torrential rain and winds scream at 73 mph according to some reports. Reporters broadcasting from the ground look miserable despite shell jackets and hoods drawn tight. Every framed shot includes trees or another device to demonstrate the force of the wind or rain. Common sense began to kick in. A simple search reveals that not only is Houston 197 miles north and east of San Antonio, but that the home of the Alamo is 650 feet in elevation and Houston is a mere 47. 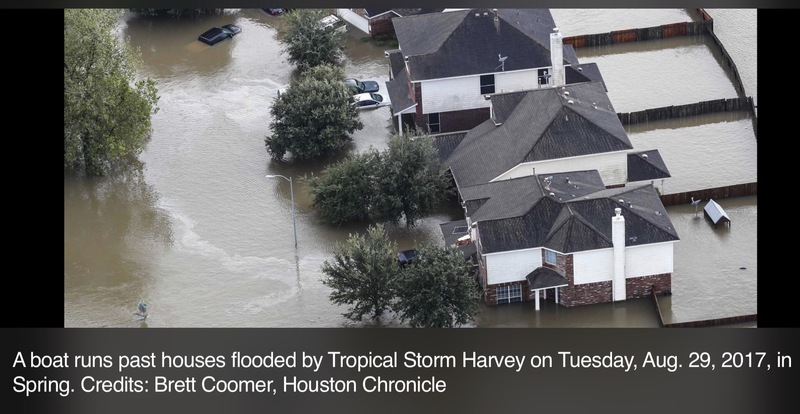 Simply put, flood waters 197 miles away and 650 feet below don’t really affect cities by the Gulf of Mexico. Thank you internet. Thank you distancesto.com. But, now the attention returns to the source of the news stories. Houston is drowning. Over 3,000 people were rescued on Monday. Tuesday is almost over and 9,200 people are staying in the George R. Brown convention center in downtown Houston. The Addicks Reservoir is spilling over its gates and the Barker Reservoir is expected to do the same on Wednesday. Nearby rivers are already swollen. The rural and suburban homes are in danger from the overflowing rivers, the overspilling dams and the unrelenting rain. In January and February of 1997 an El Niño system moved through California with a force and fury that drenched the Golden State. Late-night talk show hosts couldn’t stop blaming things on El Niño. I was living in the San Joaquin Valley at the time. This wasn’t a hurricane like Harvey or Katrina, but a depression of rain that swirled and sat on top of the valley and filled it like a trough. The rainwater filled the San Joaquin Delta and the surrounding irrigation canals to the brim. 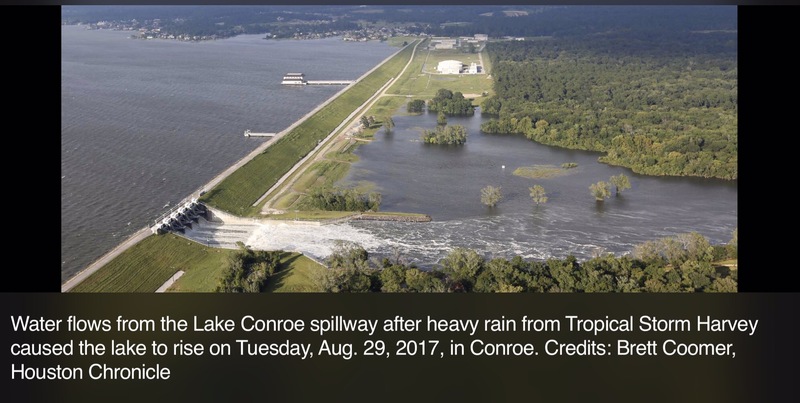 Then a levee broke. Waters were already swelling the 205 freeway that brought commuters from the valley out to San Jose and San Francisco every morning and then carried them home in the afternoon and evening. You could see it lapping an inch below the freeway during the moments when traffic came to a standstill and there was a moment to look around at the rising water and the low-hanging fog that kept the headlights on cars running day and night. When the levee broke, the waters spilled down and onto the farm lands that were the breadbasket industry for the surrounding towns and the entire county. Leaving the 205 to reach I-5 I passed the homes of classmates and teammates, and those homes were surrounded by an impassive sludge. I saw one classmate talking to the news about filling sand bags at his place. When they were done they would check with neighbors and then friends to see if they needed sand bags for their places. At that time I lived within a few short miles of these people. But I felt separated from all of them by the threat of the water. It was growing closer to overtaking the roads, the homes — my parents home. It was changing the way I was thinking. I thought I could see it on the faces of others too. 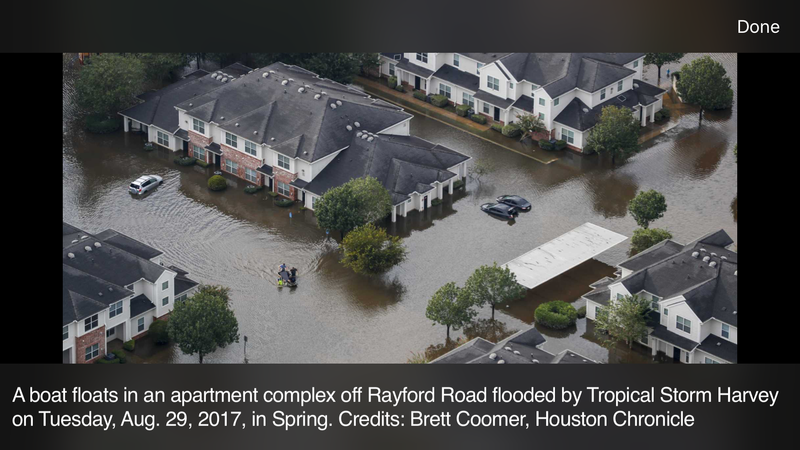 Hurricane Harvey is already changing the way scientists, government offices, media and the public understand the classifications we use for hurricanes, tropical storms and depressions, and flooding. Predictions are already stretching the duration of flooding to weeks and maybe months. From 1,900 miles away Harvey looks like a state hovering above a city and its suburbs and rural communities. When mankind faces the elements head on there is always a sacrifice. The people of Houston are facing a giant in the shape of a storm. Only the actions of the willing and the unselfish will make the difference. Only the fearless can face down a giant. That was one week ago today. Diet is important to dogs. The value of quality ingredients for dogs mirrors the impact nutrition has on humans. I tend to understand these things in the abstract while continuing to learn important details. Proper nutrition affects the quality of dog’s teeth. Veterinarians have long held the belief that regular cleanings can extend the life of a dog by years. Which only confirms what nutrition experts have been telling people — us — recently about dental health’s link to heart disease and potentially catalyzing other maladies. Three days earlier I had met with a local dog trainer who also has a boarding business called Cultured Hounds. 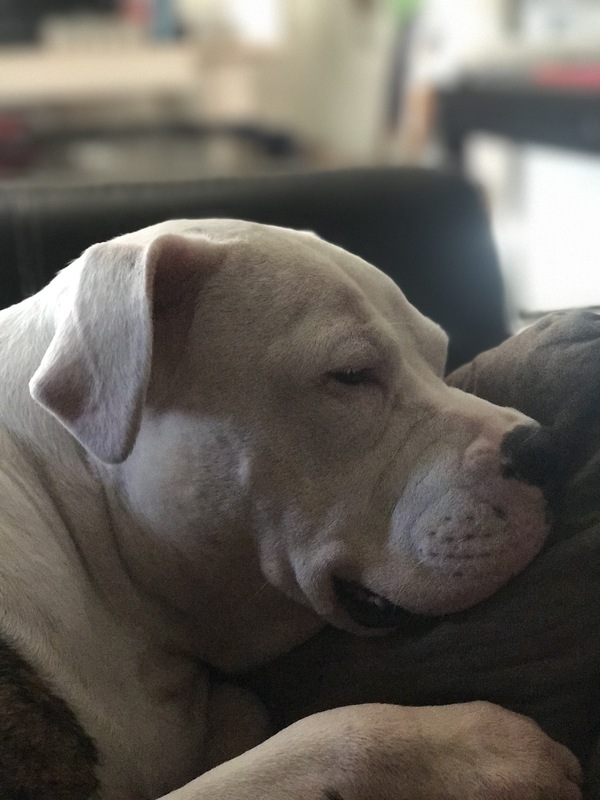 We were talking about my 4-year-old pit bull Fiji when the discussion turned to nutrition. Spencer noted that grains like wheat and corn stick to a dog’s teeth like candy and sugar do for humans. This can lead to tooth decay and body tumors. The subject had been on my mind since March when my wife pointed out that our French Bulldog puppy Bruno had developed stinky breath. Bruno just turned 18 months and his breath had stayed sweet like a puppy. Until now. I smelled it and it smelled like he had eaten something spoiled. Not quite like milk, meat or fish, but something sweetly soured. After meeting with Spencer, I could not stop thinking about these dogs. My wife and I were responsible for providing them with the best care and quality of life. Bruno and Fiji if adhering to alphabetizing. Fiji and Bruno in order of arrival. I feel like the subject of good dog food is so broad and at the same time the subject of the best or the right dog food becomes such an opinionated claim on the part of the writer or the readers. Ig feels like a disservice. I don’t know to who, but someone is being offended when the best dog food is stated. I used to think that all food was the same. Growing up, my parents raised an Alaskan Malamute and a small mutt with Shitzu features on the same 50-pound bag of dog food we had always bought from the local feed supply store. Those dogs lived to the ages of 17 and 14, respectively and they rarely suffered from any complications. We regularly fed them dinner scraps and the concept of add-ins like salmon oil on their food was as foreign as a duvet in the small town where we lived. 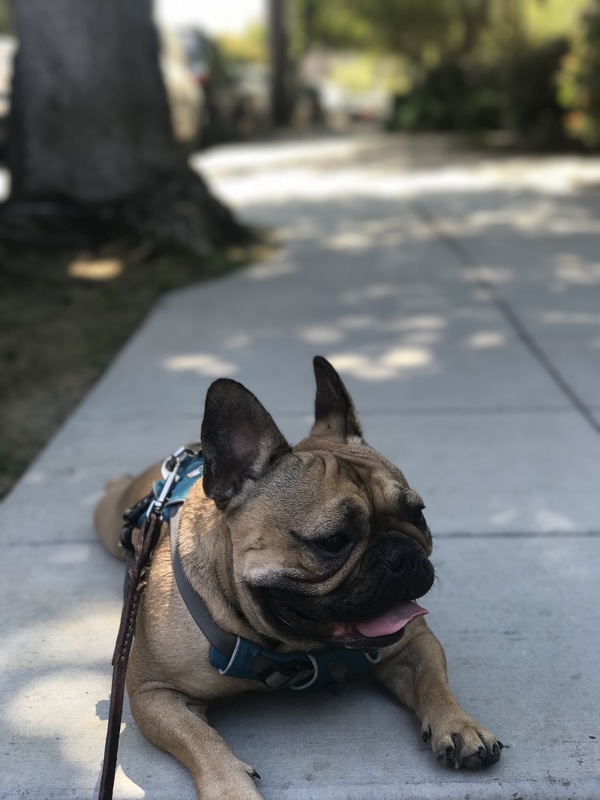 When I met my wife, she had a French bulldog named Tito and he had a yeast condition that made the skin under his short wiry coat dry and flaky. The skin would crack and sores would form and then scab and then crack. This made the poor little guy itchy and smelly. We tried oatmeal shampoo and conditioner, and then every other skin-treating shampoo, conditioner and topical ointment, wipe or spray we could find. My wife heard from a dog trainer that some dogs are allergic to gluten and other grain-based foods. We tried raw meat like chicken and fish. Which eventually became too expensive to sustain without a discount option. Luckily grain-free foods like Taste of the Wild and other brands were emerging. Tito’s coat softened and his skin stopped producing yeast. We included salmon oil to improve his digestion and to offer one more layer of protection for his skin and coat. Soon the dry flaking and sores were also gone. Meanwhile our pit bull Lucy’s coat also grew softer from the change in food and her digestion and bowel movements became regular. Our current pit bull Fiji was skinny when she first came to our home from the Berkeley Animal Shelter. She responded quickly to our grain-free dog food diet. Fiji’s only skin issue is that she chews her paws. Changing her food between grain-free options had no impact, but it could be anxiety or an allergic reaction to grass or pollens. Fiji was blessed with loose but not saggy skin, hair softer than teddy bear fur and teeth that are clean and fresh like a puppy. She will turn five in December and none of that has changed. This makes it hard to gauge how food impacts her, and because emotions play a significant role in the regularity of her digestion, that is often a poor indicator of Fiji’s stomach and intestines. When a noise startles her I’ve watched her stop in the middle of squatting to look around and wait. If she is not satisfied with where the sound came from, Fiji will straighten up and walk away from what she was doing. But, I know that Bruno’s breath had changed despite a rotation of different dog foods that were grain-free. My appointment with Cultured Hounds had confirmed that I needed to think about how to combat his sour breath and that improving his dog food was a good place to start. And Fji’s blessed teeth and coat would not stay perfect forever, but if I gave her the best nutrition it could be a foundation that would extend them for most of her life. Back in PetVet, I looked around and thought about the best option. The price of the raw food options made them an unsustainable choice and I considered the next best choice. I must have gone down every aisle four times. I kept returning to the limited-ingredient brands. Someone my wife knew had mentioned that limited-ingredient food had made a difference for her dog. I waffled between two brands that seemed equal in value. Then I made a choice and bought CANIDAE Grain Free Pure Sky* Made with Fresh Duck. I switched them over to the new food the next day and watched their behavior. They definitely enjoyed eating it, but it will be a few days before I can say how much of an impact it has had on their digestion or allergies. I also purchased a small bag of California Natural Limited Ingredient Venison and Green Lentils. I am hoping that one of these options will lead to improved health for both of my dogs. I also know that quests involve time and multiple attempts and a few false starts. But, their endings equal more than the efforts to reach them. It is difficult news to hear, let alone process. But, the facts, equal to the doubt and skepticism, are looming to meet us in the ever-approaching future. On April 12, 2017 a trillion-ton iceberg more than twice the size of Lake Eerie broke away from Antartica. Coastal flooding is coming. It will arrive within the next 20 years. By 2060 it will be a part of daily life. Any chance to reverse this outcome has almost completely slipped away. I have lived in California since 1985. We moved from Long Island, NY the week of my eighth birthday. On weekend mornings my mother would knock on my bedroom door to see if I wanted to catch a ride into work with my dad. He commuted every workday-morning from our little home in the San Joaquin Valley to Foster City, Ca. We had to be on the road by 5:30 a.m. The commute was something that dad always complained about, and trips like this helped me understand his frustration. At that time the 580 was barely three lanes. We drove through the Altamont Pass and over the Dublin Grade, traffic thick like a herd of cattle. The 238 connector, which we reached once we past Castro Valley, was under construction to widen from two lanes to four, but that was still a work in progress. Dad alternated between slamming the brakes and punching the gas. Mom put her feet on the dash and gasped every time the car stopped or accelerated. I don’t know how he did it every day — without become an alcoholic, a ball of anger or a defeated subjugate — which were the only courses of action that I saw available in the midst of the chaos I was witnessing. But somehow, we were at the toll gates and passing over the San Mateo Bridge. Dark and forbidding waters below began to reflect the rising sun as we rose to the apex, crossed it, and veered down to the waiting city. Once we dropped off dad, and I had run inside to use the bathroom, mom and I and sometimes my sister, would drive down to Half Moon Bay. We picked an open beach like El Granada or Miramar and found parking. Then we hiked down to the sand and looked for tidal pools. My sister and I had been to aquariums and recognized the sea anemones and their floating tendrils. We watched the waves rush in and recede, and stared at the tiny bubbles that gurgled when the water drew back to the sea. We were told that it was sand crabs, but the idea just made me giggle. Until I could see them, the whole concept was just a tall tale to trick me. On one of our first visits, we were so busy looking in the pools that we all failed to notice the tide was coming in, and fast. Suddenly, one wave crashed forward and my pants were drenched from the knee down and my shoes squished as I scrambled to get away. My mother and sister shared my soaked experience, and together we slogged our way back to the car. Mom drove us into town and we found pastries and hot chocolate to soothe the soggy soles of feet and our stomachs. Despite the drenching, we learned from that day on to watch the water; where it was going and when it was coming back. 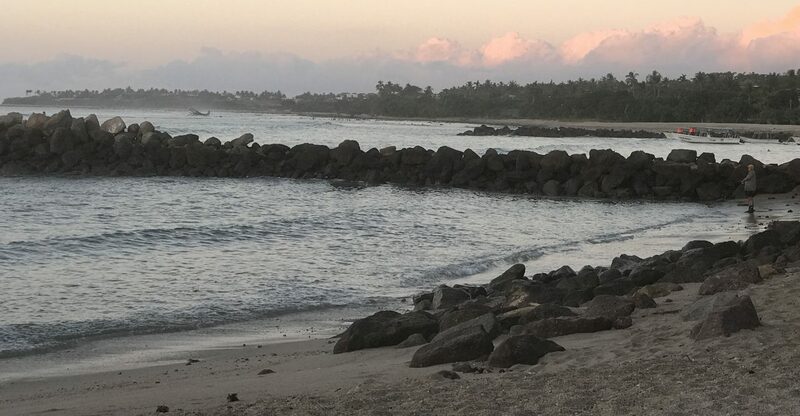 My mother loved to remind us to, “Never turn our backs on the ocean.” We had experienced a painless and humbling reminder. We were just visitors to a place where the ocean set the rules and changed them for its own reasons. It seems that we have lost that understanding. The cliffs along Pacifica, have been crumbling for years now. Two months ago, another section fell to the ocean floor. Apartment and condominium buildings have been condemned and residents forced to relocate. The news that 10 percent of the Larsen C ice shelf has broken away and is adrift, has generated the same response that similar breaks in 2002 and 1995. Dire warnings and predictions, followed by little else. Perhaps it has something to do with a statement from Ted Scambos, a senior research scientist with the National Snow and Ice Data Center in Boulder, Colorado. Scambos was answering a series of email questions from NBC News. One question, and its answer, illustrate the current understanding of what is happening. According to Scambos, this most recent ice break does not even register in the top 10 of events recorded since the 1960s. Stories published on the National Geographic and San Jose Mercury News websites reported on the findings of the Union of Concerned Scientists. The National Geographic story explained the reasoning for the research in a response from co-lead author of the report Erika Spanger-Siegfried. According to the report, there are currently 90 communities across the country battling coastal flooding. That number will double in 20 years. The San Jose Mercury News provided dire predictions for communities in the Bay Area. By 2060 the following cities: Alameda, Oakland, Palo Alto, East Palo Alto, San Mateo, Burlingame, San Francisco, Corte Madera and Larkspur will experience flooding 26 times per year, or every other week. Last year the federal government announced its first grant to buy and relocate the small town of Isle de Jean Charles, La. for $48 million after reaching the conclusion that it was not worth saving. It is unlikely that the nine Bay Area cities facing flooding will be able to receive such assistance. The waters will continue to rise. As a nation, as communities, we have a choice regarding what will be done. We can turn our attention away from the oceans and know that one day it will crash into our plans, following a long-term schedule that does not take us into consideration. Or we can turn a watchful eye toward the rising seas, study the interactive maps provided by the UCS and begin answering the hard questions about the cities and communities that will suffer first.